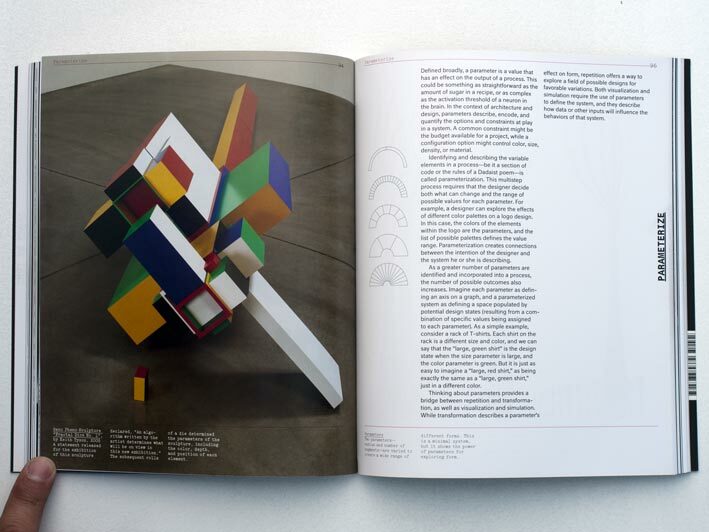 Form+Code: In Design, Art, and Architecture is an ambitious new text that investigates the creative exploration of software across numerous disciplines. A collaborative venture between artists Casey Reas, Chandler McWilliams and the graphic design studio LUST, the book presents both a succinct history of computational design and an indexed guidebook of strategies and approaches. Form+Code fundamentally differs from more traditional, tutorial-based books on creative coding by delving into precise contextualizations of the origins of various tangents within software art. The scope of these nuanced discussions is both sweeping and extensive. For example, within the space of six pages, the authors examine the computer as a drawing instrument starting with Ivan Sutherland’s Sketchpad proto-CAD workflow (1963), then turn to advances within various proprietary applications, which opens up into a discussion about digital representation and fabrication. Form+Code is full of these compact histories, and each is tastefully illustrated with related contemporary projects and (sometimes surprising) precedents and predecessors. Op-artist Bridget Riley’s Polarity (1964) sits in a spread beside Martin Wattenberg’s music visualization The Shape of Song (2001), highlighting the similarities in the graphic language of luminaries from two distinct generations. The first portion of Form+Code is dedicated to unpacking the idea of the algorithm in everyday language (“a precise way of explaining how to do something”) and using that to ease into a conversation of how and why we might think in code. The authors have been quite careful in setting the stage here, and the opening act includes nods to 1960s conceptual or process-based multidisciplinary artists like John Cage, Yoko Ono and Sol LeWitt (a longtime muse for Reas), early specialized programming languages like BEFLIX and the freewheeling media theory of Marshall McLuhan as instances that helped to nurture an environment where it would be natural for artists to start exploring computation. The remainder of the book is dedicated to cataloging five general strategies through which artists engage code in the production of work: repeat, transform, parameterize, visualize and simulate. These approaches are not presented as mutually exclusive categories and each of these sections dives into a robust philosophical discussion about creativity. The chapter on repetition, for example, brings together a modular coat hanger system by MOS architects, early browser art by jodi.org and 1960s plotter drawings by Frieder Nake, and each thematic survey is equally multidisciplinary. The work accompanying each chapter is excellent, impeccably photographed and complimented with a wealth of thoughtful references culled from relevant scholarship and broader visual culture. In a blog post announcing Form+Code, Casey Reas described key goals for the book as being an affordable, widely available publication that follows in the footsteps of seminal design texts such as Ellen Lupton’s Thinking with Type. The project is successful on all fronts and in bypassing the ‘coffee table book’ or ‘veterans-only technical handbook’ formats the text delivers as a comprehensive introduction to thinking with code. It also doubles as a vital snapshot of recent new media art and that fact, coupled with an accompanying repository of Processing examples will undoubtedly make Form+Code invaluable to students, educators and curious enthusiasts alike. 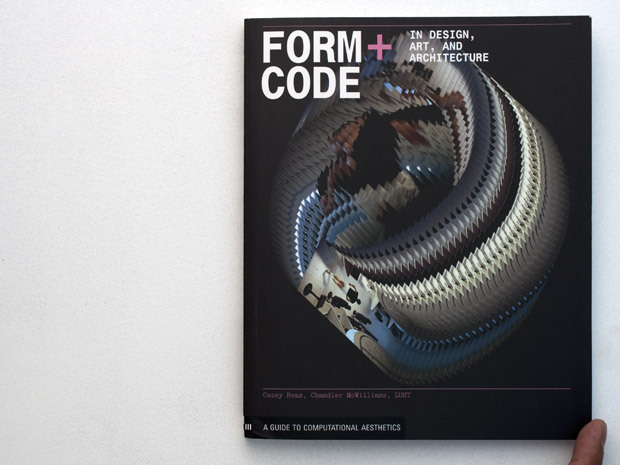 Form+Code was just published by Princeton Architectural Press and contains work from: Aaron Koblin, Ben Fry, Erik Natzke, Golan Levin, Greg Lynn FORM, Jonathan McCabe, Khoi Vinh, Marius Watz, Nervous System, Morphosis, United Visual Artists amongst many others.